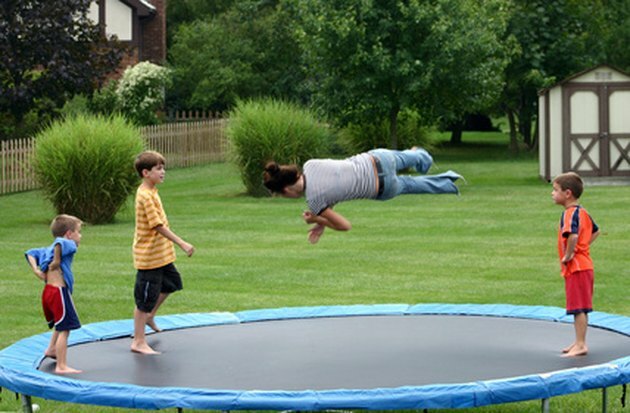 Trampolines provide hours of entertainment and exercise for both children and adults. Bouncing on a trampoline increases heart rate, strengthens muscles and joints, improves posture and reduces body fat. But over time, dirt, dust, body oils and other debris can collect on a trampoline mat, forming a black residue. Keeping a trampoline mat clean and free of residue will cause the trampoline to appear shiny and new, while allowing it to last longer. Black residue can be removed from a trampoline mat. Sweep the trampoline mat with broom to remove loose residue. Remove as much of the loose debris as you can. Fill a bucket with lukewarm water. 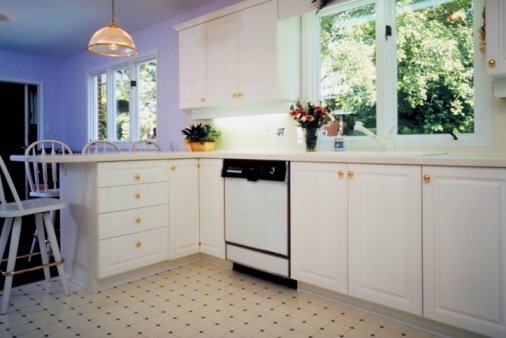 Pour two tablespoons of liquid dish detergent into the water to create a soapy solution. Spray the trampoline mat with water from a garden hose. The mat should be completely soaked before attempting to remove the black residue. Dip a scrub brush into the soapy solution. Scrub the trampoline mat thoroughly with the scrub brush until you completely remove the black residue. Rinse the trampoline mat with water from the garden hose. Dry the trampoline mat with a clean towel.